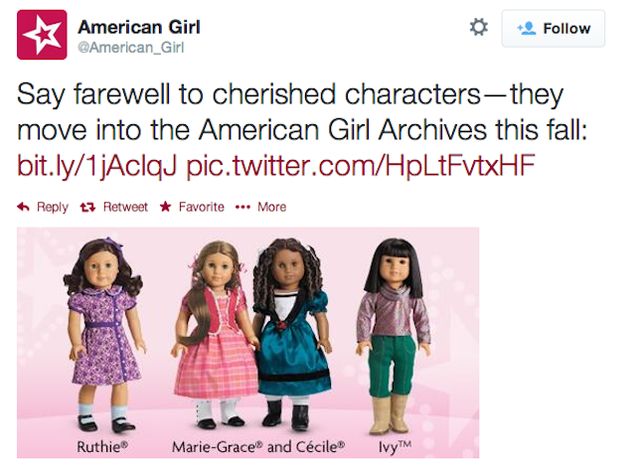 Is American Girl stuck in the turn of the 19th century or nah? For those who aren’t familiar, American Girl is a line of dolls, story books and games with time period-themed characters. When I was a little girl, my mother purchased my twin sister and I every Addy book and eventually the matching toy. I loved "Addy" so much; she was a gorgeous chocolate-toned doll with shiny brown hair and a spiffy red dress. Her story equally had in me awe. Addy was a slave who ran away in pursuit of freedom and her journey to re-connect with her family represented everything I desired to be: courageous, kind, and bold. Eventually I grew out of Addy, but her story of strength and resilience stuck with me. Looking back, I realize how important it was for me as a young black girl to have someone to relate to. Our formative years are during childhood and if we don’t see the right images of ourselves during that time, it becomes easy for us black women to feel lost. My mother made it her point to purchase my sisters and I black dolls from both mainstream and independent companies; dark-skinned dolls in particular. Unfortunately, Asian girls looking for toys that reflect them are not as fortunate. American Girl announced on their Facebook page that they will no longer be carrying two important dolls of color: African-American “Cecile” and Asian-American “Ivy.” Now there are only three ethnic characters left: “Addy,” Latin-American “Josefina" and Native-American “Kaya.” Sure, it is great that there are still some left, but what about the Asian community? Don’t they deserve to have a doll that they can call theirs as well? It is time for children’s companies to start looking at the bigger picture. I say, bring “Ivy” back. The world isn't just black, white, and Hispanic; it is also Asian, Middle-Eastern, Pacific-Islander and everything else in between.